A great heavy duty range bag that doesn’t weigh a ton and offers serious support and carrying capacity, with the utility and comfort features you need in a bag that can carry as much as this bag can. It is made for long-term ownership and the BLACKHAWK! brand is very good at producing bags and cases that can hold up to regular use over many years. This is the bag for range-goers that need 2-3 pistols, ammunition for an extended session and hearing and eye protection, a small cleaning kit and some other various tools and accessories. It’s a serious range bag or it can be used as a bug out bag option or for the gym, or even as a small weekend travel bag. It’s stealthy enough to not be a “gun specific” bag, but it’s built with features that will truly appeal to the gun people out there that want the best in class for a good price. 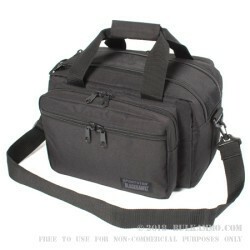 A stealthy stash pocket, three dual zipper compartments and the Velcro joinable handles as well as a shoulder strap means you won’t have a problem finding a preferred way to carry this well detailed, well-built bag. I ordered more of em as gifts plus more for me! The best deal in a range bag I've found anywhere. Large enough for everything you need for a trip to the range. Bulkammo shipped fast and it was well packed in the box, I ordered three of these and they all arrived in perfect condition. This is my first order from them and it won't be my last. Awesome bag and lots of space for 1-2 guns and ammo plus some eyes and ears. This item, is too nice. There is no downside. It's just stupid how great this bag is.....You can take everything that typically comes in a new pistol package (books, mags, gun, locks, keys ect) and fit into a single bag - for two pistols.